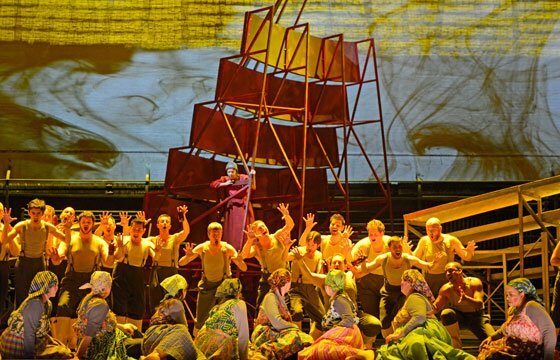 The Boston Lyric Opera’s production of Richard Wagner’s Der Fliegender Holländer, given last night at the Citi Performing Arts CenterSM Shubert Theatre and continuing through May 5th, was intelligent, surprising, though just a bit too graphic. Offered on its first night without intermission, this three-act, 140-minute production of the 1841 score (related article here) is a “reexamination” of Wagner’s first operatic masterpiece, and a refreshing take on an old standard of the German Romantic repertory. Oddly enough, the most interesting aspect of this production is its staging. Most others emphasize the different and gendered worlds of the opera—the men belong at sea and the women belong on land. 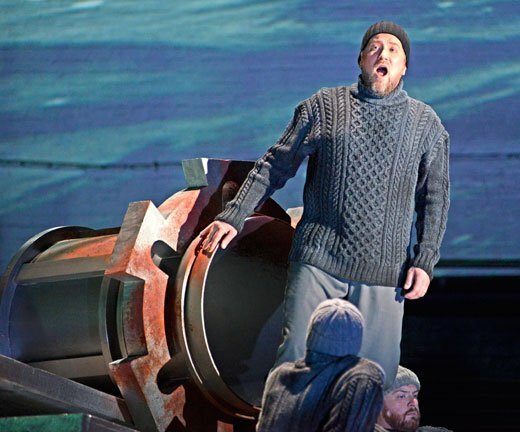 The balance is upset when the Holländer steps ashore and only resolved when Senta returns with him to the sea. (Of course Senta’s fiancé, the hunter, is the exception, but his is the world of the forest—a romantic frontier akin to that of the ocean). However, by having the character of Senta remain onstage throughout the opera, John Conklin and Michael Cavanagh of the BLO have hit upon an ingenious solution that simultaneously challenges and personalizes the borders between the two worlds. Appearing variously as an innocent child, adolescent, and woman, Senta’s presence takes on many idealized and nostalgic forms. At one point she seems to be the subject of the steersman’s dreams—a vision of the Ewig-Weibliche (eternally feminine); at another she represents a doting father’s perception of his grown daughter—who he still sees as a child; and of course she also appears as the last hope of redemption for a dark and murderous man. Her continuous presence, observing as often as not, centers her perspective on the narrative. She is the Romantic ruckenfigur (figure seen from behind) through whose eyes we see the events of the opera develop. However, Senta also wears red. The color stands out, even pops against the dreary background of the fish cleaning hall or on board the ship. This red matches Senta’s hair, it matches the red of the Holländer’s sails, it matches the blood on her mother’s blouse (an earlier victim pantomimed in the overture), it matches the seven-year old Senta’s hands drenched in her mother’s blood, and lastly it matches the red of her blood when she slashes her own throat in the riveting final scene. Unfortunately, the color, combined with the violence, places this Senta in the staging tradition of other women in red including, obviously, Tosca and Carmen. Indeed, the image of a child drenched in another’s blood hearkens back to the 2010 BLO production of Tosca in which the shepherd boy in the third act pastoral mops blood and brain matter from the stage floor with a sponge. It was unnecessarily shocking then and here it is even less appropriate. The bloody and graphic world of Carmen and Tosca are related aesthetics that characterized Romanticism in its latest stages of the 19th century—leading to and participating in the verismo. In a production that seeks to “re-examine” Wagner’s opera in its original shape, as a “strong, light and energetic early Romantic score” the graphically violent ending is an unnecessary effect that is simply at odds with the opera’s style, time period, and the production’s stated goals. As Senta, soprano Allison Oakes is striking. Her powerful voice is remarkably consistent throughout its registers, cutting through the orchestra with ease and nuance. Her physical presence is commanding and one is not surprised to find that her stop here in Boston is on her way to the Bayreuther Festspiele. To his credit, Cavanagh displayed Oakes wonderfully in his blocking. For example, in the second act ballad, he positioned her downstage and high on a riser for the lingering opening “Johohoe.” The effect is chilling. As the Dutchman, bass-baritone Alfred Walker was equally remarkable. The low end of his range was extraordinarily resonant, filling the room. As Senta’s father, perhaps the most difficult dramatic part in the opera, bass Gregory Frank authentically managed to express his character’s contradicting motivations of greed and paternal love. Indeed his humor actually upstaged the Dutchman’s gravitas in their Italian-style first act duet “Wie? Hört’ ich recht?” Tenor Chad Shelton’s clear, ringing tenor made the hunter’s naiveté and frustration nearly tangible. The opening of the third act, the famous sailor’s chorus, was fantastic. The contrast between the living sailors and the Dutchman’s crew was terrifying and exciting at once, achieving the spectacle and local color that Wagner must have imagined when writing a peace for the Paris Opéra. Usually scholars characterize Wagner’s later revisions to Der Fliegender Holländer as attempts to “alter perceptions of his own development, and to pretend that he was already writing in a much more mature style.” However, this performance undermined that argument. David Angus’s subtle rendering of the score brought to life its many classic “Wagnerian moments.” For example, the awkward moment shared between the Dutchman and Senta at their first meeting, unsung but articulated by the orchestra, is clearly an ancestor of Siegmund and Sieglinde’s first meeting in Die Walküre. Wagner’s transitional music between acts in this opera is also obviously idiosyncratic of his mature works. However, this opera is lighter and faster moving than Wagner’s later works and this production works just fine without intermission—if anything, it felt like it ended too soon. Can anyone explain why the “Spinning Chorus” with its mention of threads was accompanied visually by the cleaning of fish? This review captures the success of the singers and musical direction in this marvelous production, but it omits the great visualization of the varied settings, climates, moods, etc., by the designers of the various staging elements, particularly the lighting. Altogether a fabulous realization of inherently impossible situations — storms at sea, ghosts, a battalion of singing spinners, etc., etc…. Hi, Martin. I was a member of the ensemble in this production. 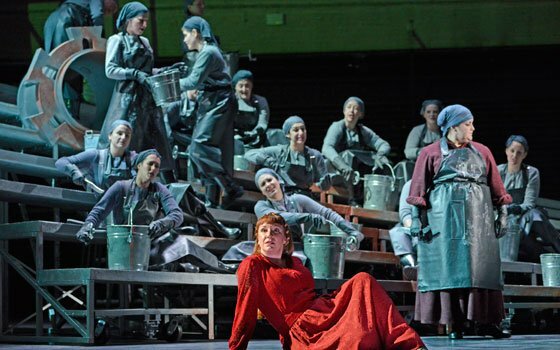 The director thought that women working in a fish cleaning factory evoked the opera’s setting in a Scottish seaside village. We were still “spinning,” but spinning mechanical wheels and knives rather than literal spinning wheels. The text certainly does mention threads, but the director wanted us to treat the singing of that text as a work/folk song sung to pass the time, rather than a literal narrative of the work we were doing. Martin–I thought the “spinning chorus” was odd too (are we to believe that folks in Norway don’t fish or that folks in Scotland don’t spin wool?) but I thought that this was chosen because the metal buckets (and fish) matched the production’s overall color palette (e.g. the Dutchman’s silver overcoat). On a related note, I wasn’t as impressed with the varied settings and lighting that Jerry sites–the production was terribly dark. In other productions this darkness is broken up when the scene shifts to the interior of the “spinning room” but here the “fish cleaning hall” was dreary too. The singing though, especially your ensemble Stephanie, was wonderful!